Growing up in New Hampshire, looking up into the sky and seeing countless stars was a nightly occurence. I almost took it for granted. However, after living in both Boston and New York City, I have certainly grown to appreciate a clear night with a sky full of stars a little more. Matt and I spent our honeymoon in Hawaii (the first 10 days on the island of Kauai and the next 4 on the Big Island). We had such an amazing trip it is impossible to highlight just one activity or day as my favorite. However, one thing that certainly stands out as an incredible experience was our trip to the Mauna Kea Observatory. 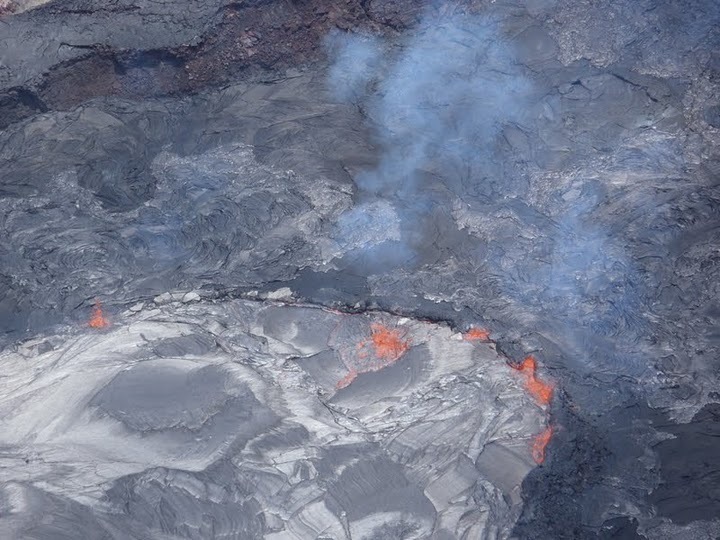 On the Big Island there were two things that we knew we wanted to do: see the volcano and visit with my cousin. Upon arrival to our hotel, we talked with the concierge about other activities available on the island. They mentioned the Mauna Kea Observatory; which we had never heard of. We researched it a little more and thought it might be something interesting to do and it was on our way back from the volcano. So after an incredible helicopter tour over the volcano where we saw some liquid hot magma, we ventured off to the observatory. After driving into the middle of the Island, we took a right turn and started heading up the mountain. In less than 20 minutes we went from sea level to more than 13,000 feet. I was worried about getting altitude sickness (I watch a lot of Beyond the Limit: Climbing Mt. Everest) but we managed to make it to the top ok. The landscape was amazing – I think I said to Matt “I feel like we are on Mars” more than 15 times. Before heading down the mountain we watched the sunset, above the clouds. It was truly beautiful. Unfortunately, the pictures that I took didn’t come out as well as Matt’s camera. Hopefully I can get him to post his pictures online sometime soon so that you can see them. We drove down a few thousand feet to the visitor center and waited for the sky to get dark. 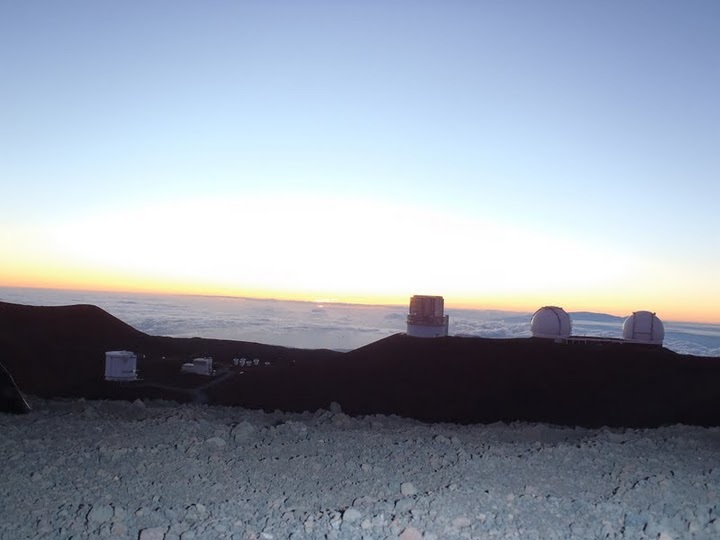 We learned that the facilities are located in a 500-acre (2.0 km2) special land use zone known as the “Astronomy Precinct,” which is located in the Mauna Kea Science Reserve. 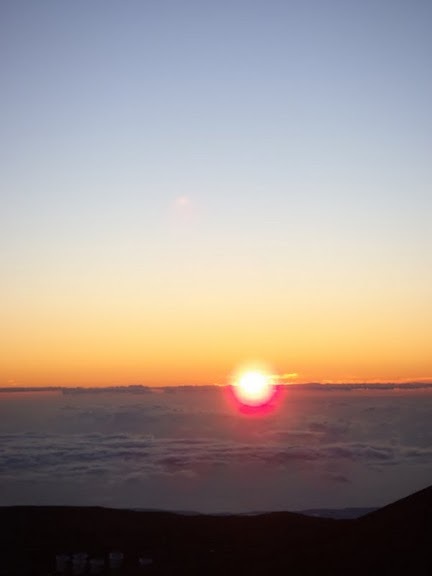 The Astronomy Precinct was established in 1967 and is located on land protected by the Historical Preservation Act for its significance to Hawaiian culture. The location is ideal because of its dark skies, good astronomical seeing, low humidity and position above most of the water vapor in the atmosphere, clean air, good weather and almost equatorial location. And we happened to be there on an evening with no moon – idea for star-gazing. The center had set up a few telescopes for us to use and Matt and I peered through in awe as we saw a crystal clear image of Saturn, a cluster of stars that was formed before the Milky Way and Mar’s red glow. The “star guide” pointed out countless constellations and we followed along with Matt’s star-gazer ap on his phone. The magic of the whole afternoon/evening was capped off when I saw my very first shooting star. The weekend I had another star-gazing experience. It was while floating on a raft in a pool located at our friend’s house in the Hamptons. No shooting stars this time, but still a good time.